What a fabulous question! The fact is most marketers blame their agency when the relationship is falling apart or if the work isn’t breakthrough or strategically grounded. But the fact is, there is no such thing as a relationship failing solely because of one person or one side. It takes two…100% of the time. And if a marketer decides to run a review without fixing their issues, it’s only a matter of time before the new agency relationship starts to break down too. 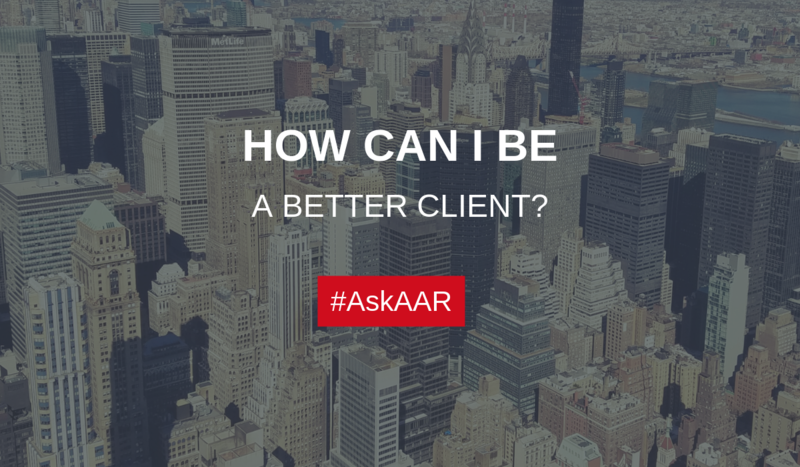 So how do you become a better client? Well, there are many skills needed but the essential traits or qualities interestingly enough are the same for successful personal relationships as they are for business relationships. Integrity – Do you trust each other? Not do you trust your agency. Do you trust each OTHER? Agencies need to trust the fact that you have their back just as much as they should have yours. Each partner should feel comfortable leaving the business in the hands of the other without worry. Dedication – Are all people involved from your side of the business fully dedicated to the success of the business and to the needs of your agency in order to succeed. Vision – Is your team internally aligned on the vision of the business in order to be able to clearly share that vision with the agency? Everyone needs to be on the same page and moving toward that aligned vision. Openness – Be sure to listen to all ideas and suggestions and be open toward the possibility. Find those insightful nuggets together by listening to the agencies research and strategies carefully before talking. Communication – The key quality is effective communication. Do not hold information close to the vest. Do not give loosey goosey direction. Tell the agency exactly and specifically why you like or don’t like a particular direction or strategy. Back it up with facts or insights, if possible. CLEARLY, communicate by giving detailed feedback… consistently. Finally, drop the blame game! A successful client-agency partnership is based on “we” not I. And when things don’t go right, look internally first before pointing fingers. I’ve heard myself say hundreds of times over the years, “garbage in, garbage out.” And finally, be fair in your compensation arrangements… agencies provide a lot of resources, talent, and IP and they do need to be paid appropriately without feeling like they’re being browbeaten into below-market fees.